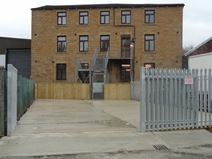 Office Space - Dewsbury, West Yorkshire. This nineteenth-century building is home to modern and well-equipped refurbished office suites. The space is close to the town centre and railway station, with excellent access to the motorway network. The railway station is within a few hundred yards of this centre so it is well connected by public transport. The larger towns of Wakefield, Huddersfield, Bradford and Leeds, are all easily accessible.